This isn't a prop easily illustrated by photos, so I'll explain. 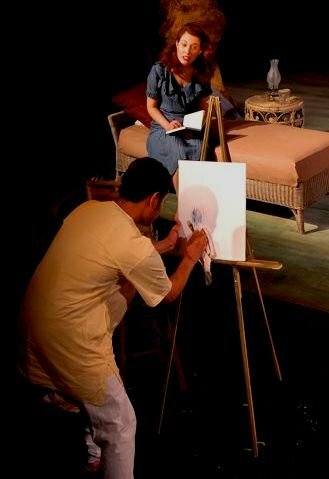 Problem: An actor must paint a portrait of a fellow actor onstage during the show. The artist has about 20 minutes to complete skilled portraiture on a blank canvas in full view of 1/3 of the audience (the show was in 3/4 thrust). The actor playing the artist has absolutely no painting skills. Solution: A painting was completed on canvas and a thin plexiglass covering was attached over the portrait. The plexiglass was coated with children's washable white paint. During the show, the actor 'painted' on the white with a mix of water and acetone. During times when the focus was elsewhere on stage, he used a rag to wipe away parts of the painting under the guise of blending/blotting the paint, revealing the whole portrait by the end of the show.